ENCINITAS–Bunnie is pet of the week at Rancho Coastal Humane Society. 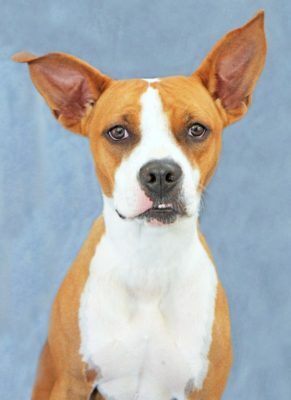 She’s a 2 year old, 38 pound, female, Boxer mix. Bunnie is bouncy and playful. She recently had leg surgery. When she’s fully recovered, Bunnie will need an active home to help use her energy. She was transferred from another shelter through the FOCAS (Friends of County Animal Shelters) program. The $145 adoption fee for Bunnie includes medical exams, vaccinations, spay, and registered microchip. For more information call (760) 753-6413, visit Rancho Coastal Humane Society at 389 Requeza Street in Encinitas, or www.SDpets.org.